Today at Tanglewood, John Williams premiered a new concert piece for harp, cello, and orchestra: Highwood’s Ghost. I was working on a story for the Washington Post pegged to the concert that, unfortunately, got pulled due to not being able to line up an interview with… well, its subject. 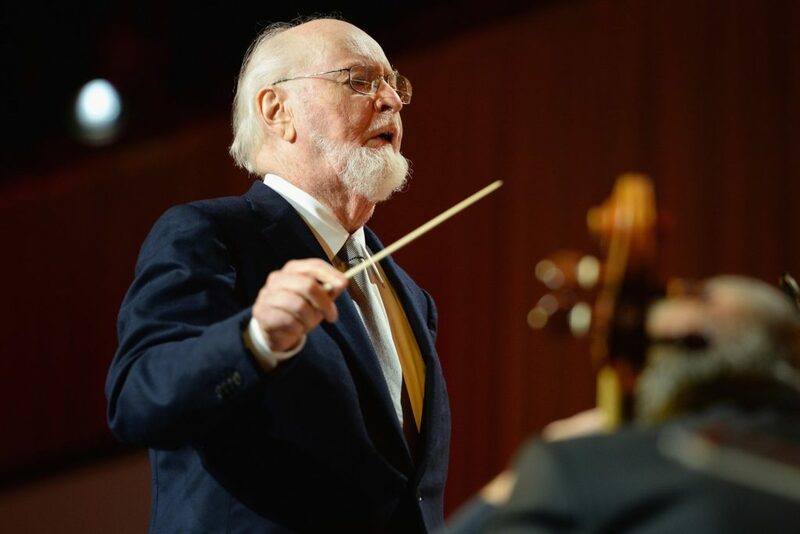 It would have been about the concert/classical “side career” of John Williams—the nature and quality of that work compared to his film music, and whether or not he feels he’s been respected by the classical establishment. As I was pursuing it, though, I spoke to both Itzhak Perlman and Yo-Yo Ma—the latter, who played the cello part today, at length. Ma was in Chicago at the time, preparing for a concert and doing work for his initiative, Notes for Peace, an artistic response to the city’s gang violence. 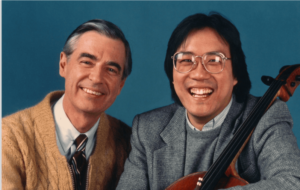 He generously gave me so much of his time, and some really lovely, optimistic, Mr. Rogers-inspired insights into my favorite composer. I had to make sure people could enjoy it… so, enjoy! Yo-Yo Ma: We’re here to talk about John Williams, who is our mutual hero. TG: That’s an understatement for me, but I know we share a sentiment about him and his music. When did you first meet John? I first met him on opening night of his inauguration as the Boston Pops conductor, when Isaac Stern was the soloist that evening. And I met this incredibly gracious gentleman, you know, who’s like everybody’s favorite uncle. He is avuncular, don’t you think? Yeah, I’ve also used the word “professorial,” but I like avuncular. Yes! Yeah, yeah, yeah. He’s professorial, too. That’s right. But he’s gentle. He’s like Santa Claus’ brother. Is that him to the core? Or is there a wild side to him, or a playful side? You’ve played both his film music and his concert music. And the music he’s written for the concert hall, in general, is quite different than a lot of his film music. It’s often more challenging, more angular, less overtly melodic and warm. Do you have any sense, or have you ever discussed with him, why that is? I’ve played so much of his music. He almost can’t help but compose, you know. And it’s all the same person. He wrote a piece that’s a concert piece dedicated to a mother whose husband murdered her two children. The mother’s a violinist in the orchestra that he conducts, and he told me this just before we recorded it—and the mother was in the orchestra. Now, this is a piece of concert music that has a story behind it. You could hear it as a gorgeous piece of music without the story. You know the story, you hear this piece. I can tell you: there was a puddle on the floor by the time we finished. Everything has a construction behind it. But as an architect of music, he’s always serving people and the landscape. Right? So in a piece of constructed music without a story, there’s always a story behind it. It could be subconscious, it could be conscious, it could be fragments. I think it’s a lie when anybody says, “Oh, I wrote this piece—it’s just notes.” That’s impossible, because there’s a reason why someone likes a fourth, or likes a certain chord progression, or whatever. In fact, that’s why you can identify, forensically, who a composer is, because you recognize the M.O. Right? Sometimes it’s a fascination with an instrument. Like for Ann Hobson Pilot—he loved Ann’s playing, he loved the harp, but he was exploring the instrument. That’s the story. And sometimes you might think it’s a struggle because maybe the piece is about struggle. Like in the cello concerto. It is about different versions of struggle, and then reaching some form of epiphany at the end. It’s implicit storytelling, not explicit storytelling. But do you think the concert hall allows him to express a different side of himself, or maybe to go further out than a film typically would? Let’s put it this way: he’s always writing for people. So he writes for Steven Spielberg, who’s coming to him with a story. And when he’s writing for an orchestra, he’s collaborating with the orchestra that he imagines. Right? So he has very specific relations with different orchestras—with the LA Phil, with the Boston Symphony, with the LSO, with the Chicago Symphony. Long-term relationships. So when he writes a piece for either an instrument or a film, he’s writing for specific people. And he’s writing from his knowledge and experience. That’s a tip of the iceberg. Okay, this one doesn’t have visuals. But, you know, you might be the person providing the visuals. The point is, there’s always going to be a background story, a moment of inspiration, a spark that leads to an exploration, right? But it’s not explicit. Unless, of course, it’s like the death of these children, and then suddenly he has to write this piece. And it’s both joyous, devastatingly beautiful, and devastatingly filled with the grief of life lost. So sometimes pieces can have many different sides to it, and in fact that’s what makes music so wonderful, is that you have as many interpretations as there are people. One of the things I’m interested in is this dichotomy that’s been imposed on film music as opposed to concert music, and this idea of “serious” music, or high art versus low art. Do you think John has received less respect in certain classical circles because he comes from the world of film? And that’s not from a non-intellectual, like, “Oh, life is wonderful” way. No. If you care to look into something deeply enough, you will find what is the most special. We’re so invested in the top ten, in the best, in “this is better,” “this form of music is better than something else,” “I’m superior to that because my car’s better,” or “my CV is longer, and I went to more years of school.” And because the world is so busy, we need Consumer Reports to help us identify [laughs] the best brands. We actually stopped thinking when we over-rely on the intermediaries to tell us something is better or deserves more respect. And that’s awful, because as soon as we start to do that, we start to lose our humanity. And that’s a disease. It’s a disease of our incredibly competitive, hierarchical world. And thank God we have things like music that can actually take us out of it, because music enters into both our conscious and subconscious minds. So it titillates, it stimulates our imagination, and stimulates our ability to empathize once again—as opposed to live in the fear: “Oh, my editor’s going to cut my piece,” you know. Whatever. “Why doesn’t my editor want this piece? It’s so obvious that this is an important piece to write.” It’s like we’re blaming people or things we don’t take acknowledgement for, you know, this is what it is. But I think because orchestras are dealing with membership sector issues—you know, are we trying to cater to young people, old people, ethnic people—we do formulaic things, and we make formulaic judgments. As a wonderful educator said, “If you want to get a career in education, develop a theory.” So we have tons of people coming up with theories, and then we have people who are practitioners, who actually know the ground, and know some theory. Then we have theorists who don’t know the practitioners. It’s like we have a mess of things, and each kind of working in their own way, and we’re making judgments about things when we’re not even qualified to make judgments. Because, as the Pope Francis says, “Who am I to judge?” [Laughs] I love it! So I ask all of us: who are we to make these judgments all the time? We make pronouncements: “This orchestra’s better.” “This brass section, no longer good.” “This young conductor, so superior.” “I think that person’s been overrated.” Based on what, may I ask? I like what you’re saying. I’ve just observed over the years different times where the “classical world”—whether it’s a music critic for a paper, or a conductor or music director—just sort of looking down their nose at film music as an art form, and film composers themselves. I wondered if that’s bothered John, and if, in his writing for the concert hall, any of that has been an attempt to show what he’s capable of to those people, or to prove himself in some way to people who do make those judgments. I think that John has had such a rich musical life, and that he has an unbelievably rich inner life. We don’t get to see it. We don’t get to hear him, necessarily, talking about his rich inner life—but we can hear it. So, I’ve never specifically talked to him about this, but I’ve talked to him about the books he’s read, about the people he’s fascinated by, about the different fields of knowledge that he knows about and that he’s interested in. See, I think just by looking at his actions I would say: the poetry of Langston Hughes, what we owe to the black community for the music that they’ve given all of us, that we profit from—he’s very conscious of that. And for anybody that says, “Oh, poo-poo” for his music, I would just like to be able to say: “Okay, let’s take a melody, orchestrate it, and see what you can do.” Because if you’re going to judge, criticize from substance. Right? Or criticize as a listener and just say, “Well, I don’t get it.” But don’t make a judgment on it. For a conductor who says, “Ah… film music.” Great! You write a piece—show me what you can do. Because if you can’t be a participant, a full participant, be careful what you say. It’s like Obama saying, “You build it” [laughs]. Remember that? I would say that to anybody who is critical of something, who puts down somebody else. Well, you do better. Show me. Don’t talk and criticize—do it, make it. You don’t like the health system? Build me a better one. Because our point, our existence, every job that we have in life, is actually to help us survive, and thrive. I think we’re on earth to actually make contribution. So let’s go do it. And we should just always think about: how am I helping to make my environment a little better? Whether you’re a writer, or you’re a plumber, or you’re paving the road, or you’re a prison warden, or you’re a composer… all of that is for humanity’s sake, it’s for life’s sake. John’s writing is art for life’s sake, and for his life, too. Because he can’t help it—he’s obsessed with writing. He has to write. He’s not saying, “Oh, gee, I have to get up and write.” He can’t wait to get to his writing desk, because he’s had thoughts and he has to let them out. So it’s a fascinating topic you’ve been mentioning about John, because he’s so prolific—he can’t help but write. People ask me, they go: “You know, you could just play the Dvorak concerto all the time, why are you doing all these silly things like Silk Road or Brazilian music?” Why should I not be? Aren’t you curious about the world? John is so incredibly curious. And he’s humble. He needs to write what he’s found out—about another person, about another story, about a discipline, about a science, about something. So he’s going to try and find a way to put it through his mastery of composition, so that it comes out in some musical form. So those sounds can be reinterpreted as the thing that gave him the inspiration. He told me something similar to what you just said, about the idea of contributing. That’s a driving force for him, is contribution to the world in some way. That, to me, seems like the opposite of ego or the expression of ego, which I think it must be for some artists—but not for him. Absolutely. And you could see that in the people he works with. You meet Michael Gorfaine, his manager, who actually will be the first one to tell you that the reason he got into this profession is because he met certain people who have helped him, and he decided that he had to work for composers because they didn’t necessarily have a voice in Hollywood. You know, “Oh… you’re a composer. No, no, no—it’s the director, it’s the filmmaker.” No, the music actually is important. I think we’ve all been to probably some film class where they show the film without the music [laughs]. It’s very different, right? It’s like, let’s take something out of this world and see how the world functions. Michael realized that, and he’s like the fiercest defender of composers, but the most empathetic person to make sure that the composers have the space and the safety they need so that they can actually best do their work. That’s the kind of person he hangs out with, because it’s so obvious that he wants to make a contribution. So how do you think history will remember John? Do you think he’ll be spoken of in the same sentence as other great classical composers throughout history? Well, first of all, if I knew the answer to that, I would play the stock market [laughs]. Or I’ll call the next election! But I can certainly see that, to your earlier point about people saying, “Oh, he’s a film composer”—I don’t hear that anymore. I really don’t. I used to hear that 20 years ago. For the same reason that I heard that André Previn, for many years, didn’t want people to know he was a jazz pianist. Because he thought, Oh no, maybe they’ll think of ill of me. Then came a moment when he thought, Oh, it’s okay, and you celebrate it. John is a very modest man inside. And I love that. He’s not trying to say, “I want to be remembered…” But guess what? History will remember him as a great figure in music in the 20th century and early 21st century, and that’s already written. I don’t think we need to look into the future—that’s already been established. And for people who don’t know that, they will find out, because that’s already there. 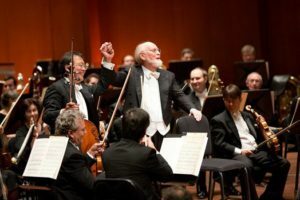 I can see that from the numbers of people in my immediate sector saying, “Oh my gosh, John Williams—he’s so great.” In the same way that people didn’t like Brahms [laughs], or Brahms didn’t like Tchaikovksy, you know. “Ugh, Tchaikovsky—terrible.” It’s like, really? Okay. Write me another symphony. 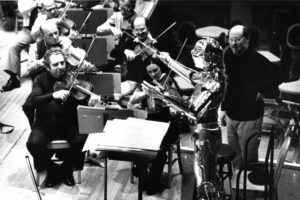 Of course history will remember John Williams, and as a great musical figure. He transcends genres. Find me another classical composer who can play the piano the way he does. Or who can be a jazz musician, or who can know all these different genres. And conduct. I mean, hello? Can we look at the whole human being and not, you know, compartmentalize? The guy’s a giant. Speaking of contribution, let me tell you something. 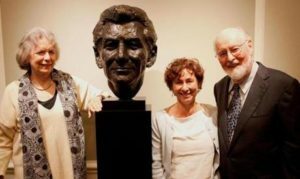 He arranged portrait statues of the three people associated most with Tanglewood: Koussevitzky, Bernstein, Copland. And he did it all on his own—paid for it, found the artist, went through all the different revisions of that. And they’re at Tanglewood. He did that as his contribution to a place that he loves. Someone should do that for John. Because he wasn’t thinking about himself. That’s how modest he is, as a person. He’s a great role model for musicians, period. He works in the service of people, in the service of others, in the service of stories, in the service of events. That’s pretty cool.